I went with my dad to a live seafood restaurant as they had half price off the menu. Dee-licious! You basically head off to the tanks and choose which marine animal you wanna eat. If not, the staff might serve you a semi-dead fish/crab to clear off stocks. Ok, I did have a tinge of guilt after I saw them being picked up but seafood tastes best frrrresh. 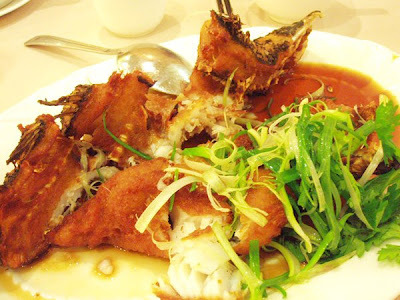 Marble Goby fried and served with a dose of soya sauce and spring onions. Crispy on outside, tender on inside. 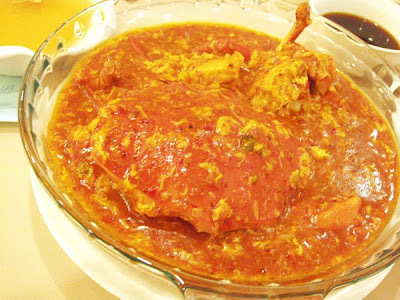 Singapore's national dish - chilli crabs. This one is drowned in sweet chilli and egg, usually it's less gravy and you serve the gravy with bread or rice. It's wonderful, needless to say. Gotta work off those cholestrol, no more seafood for 2 weeks. 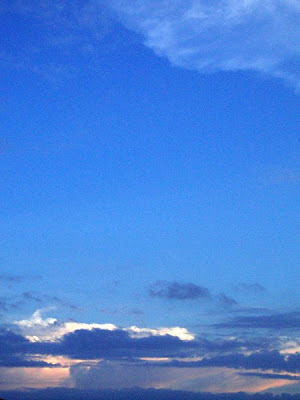 I looked out of the window and the brilliant clouds caught my attention. I love evening skies. That definately looks delicious, I love seafood more then lamb or chicken but the most I've tried is fish (haddock, salmon, tuna- I think thats it)... so not really much of an adventure with seafood. That sky is gorgeous. I love evening skies especially when there is a lot of red and orange but the sun is still so bright. That looks so yummy I want to eat it now! That sky photo is gorgeous!